Students receive £2,250 for an 8-week placement to cover their expenses. 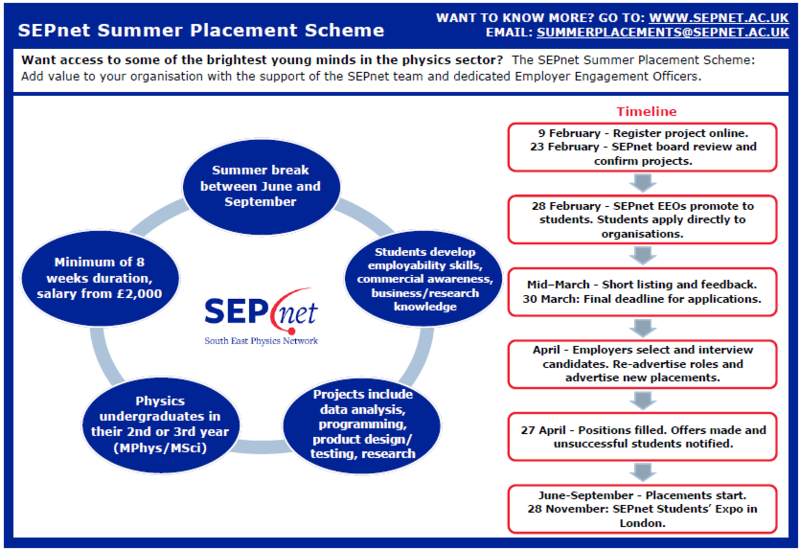 If you are able to fund a placement for a physics student, please contact summerplacements@sepnet.ac.uk and register your placement here. See below for further information. Could your business benefit from a bright and enthusiastic physics undergraduate this summer? 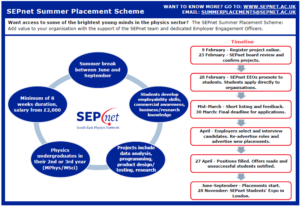 As part of the SEPnet Summer Placement Scheme we are seeking employers to sponsor physics undergraduate students for approximately £2,250 per student to conduct research or complete a project as work experience for a period of eight weeks during their summer break. Students will use the £2,250 payment to cover their costs during this period. If you have a placement project which you think would be suitable for a physics student, please register your placement here and see below for further information. Simply provide a description of your placement, then, if your project is chosen by the SEPnet board, we will advertise your project to our pool of 1,700 2nd and 3rd year physics undergraduates and ask them to apply direct to you for the placement. We will support both you and the student to minimise your workload and ensure the process is as smooth as possible. Read about some of our students’ recent experiences via our case studies, and see what one of the SEPnet universities – Southampton – says about its students’ experiences.